‘Metamorphoses’ seeks to extend the very idea of translation, and features texts which translators have transformed from a foreign original into something that is peculiarly their own. Highlights include versions of Akhmatova done by outstanding contemporary poets for Poetry International at the South Bank in 2004, as well as Ingeborg Bachmann’s ‘War Diary’, a moving document of her early life in terrible times. This volume of MPT gives a voice to the unheard and creates living connections across frontiers, cultures, genres, mediums and ages. The focus is a concentration on translations in which radical reshaping has been consciously undertaken. In their brief introductions to their translations of Anna Akhmatova – honoured by Poetry International 2004 as a great poet whose legacy continues to inspire – eminent poets and translators Elaine Feinstein, Jo Shapcott, Colette Bryce, Sasha Dugdale, Marilyn Hacker and George Szirtes write about the process of translation and how they strive to give body to the life and experience found in the poems. Poets John Greening and Neil Philip, working with 13th century Icelandic and Ancient Greek poetry respectively, playfully and ingeniously move the remote past into the forms and language of modern life. Three other poets, Kathleen Jamie, Paul Howard and Terence Dooley neatly sidestep our expectations of standard English and provide us instead with a feast of Scots, Yorkshire dialect and street slang. 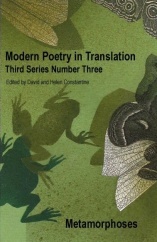 Other contributors include Josephine Balmer with her work in progress, a juxtaposition of Ovid’s poetry of exile and the documentation of wars abroad in a shared location, the Black Sea; Sean O’Brien’s moving translation of Canto V of Dante’s Inferno; and thanks to the generosity of Heinz Bachmann and Isolde Moser, the publication of their sister’s ‘War Diary’. This substantial issue gives weight to the editors’ statement that by ‘modern’ in MPT’s name, they intend “to signal a present liveliness”. Readers who wish to have their own liveliness increased are urged to subscribe.